The Greek colonies in south Italy and Sicily grew wealthy from trade and built temples to honor their gods. Although they eventually came under Roman control, the Greeks influenced the Romans with their art, literature and learning. 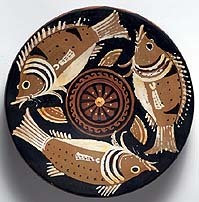 Objects such as this "Fish Dish" were made by the Greek artists living in South Italy who introduced the Romans to Greek art forms.